Most gladiators were slaves during the Roman Empire. They would entertain audiences by fighting each other or wild animals. There’s something romantic and iconic about gladiators. These warriors inspired many artists, particularly mosaic artists. The Galleria Borghese (a famous art gallery in Rome) is host to the “Gladiator Mosaic”. Discovered in 1834 at Torrenova, it depicts gladiators during combat while also displaying the name of each individual fighter (see above). Around 28 meters in length, the mosaic most probably dates back to the third or fourth century. 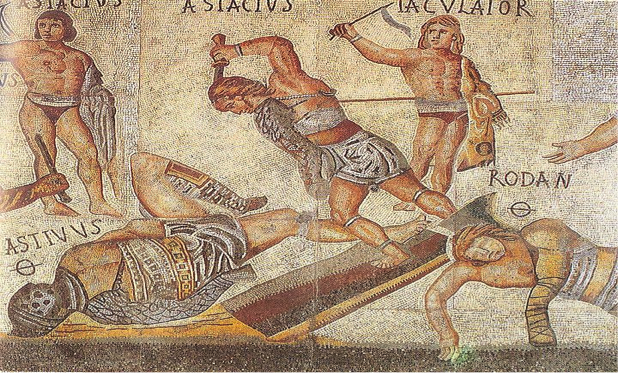 Another gladiator mosaic can be found in the Römerhalle museum in Bad Kreuznach, Germany. 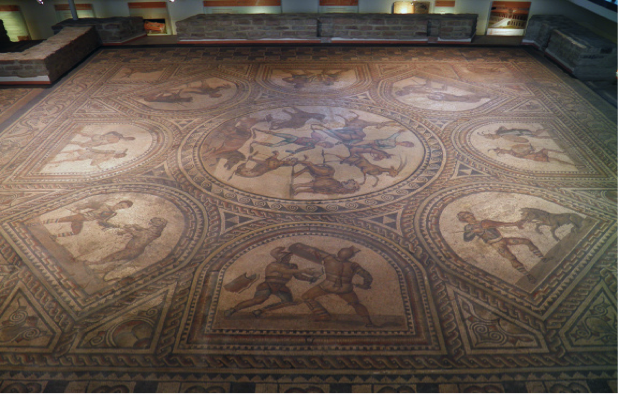 This huge 58 square meter mosaic floor contains 13 separate images of gladiators fighting animals and each other. Elsewhere, in the Villa Buc Ammera, “The Mosaic of the Gladiators” is a set of 16 squares depicting the Roman fighters. The fights usually took place in the afternoon, following the execution of criminals at noon. 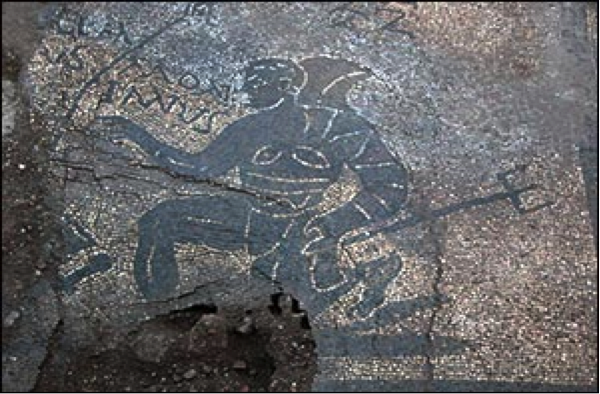 One of the most interesting gladiator mosaics was found in the south of Rome, in the Villa dei Quintili. It is said to depict the man who would become the inspiration for Russell Crowe’s character in the hit movie “Gladiator”. Montanus, represented above holding a trident, is believed to have been one of Emperor Commodus’ (portrayed by Joaquin Phoenix in the movie) favorite gladiators. The mosaic is still in perfect condition. Although these mosaics can be seen as an important gateway to a long lost civilization, it’s important to recognize the deeper meaning behind them. These pieces of art are reminders of the incredible cruelty human beings are capable of. For such an advanced civilization, the Romans could be extremely vicious; especially in the way they considered the killing of gladiators to be a form of entertainment.